Hmmm . . . this is an interesting one. 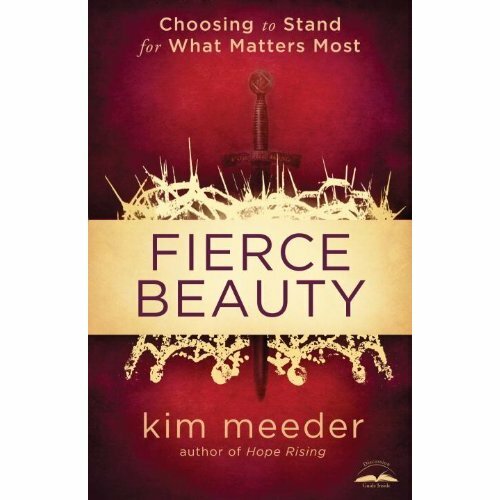 When I was approached about reading Fierce Beauty : Choosing to Stand for What Matters Most it sounded like a fabulous read. And it is. A new release from Kim Meeder (who has apparently written a few other books and has been featured several times on Focus on the Family), it advertised as being a book written to encourage women to focus on the Lord and develop a beautiful heart. No objections here and I think that Meeder definitely accomplishes said purpose. I would like to be very quick to point out that she applies scripture accurately and well from all that I could tell. Her writing style is very unique, as is the woman herself. How many women do you know that have paddled through alligator-infested swamps, climbed Mount Shasta, competed in the U.S. Olympic Biathlon Team Trials and have had frozen glaciers in Alaska almost slide down and crush them in their kayak?! Been chased by a grizzly bear? Swam with sharks in the South Pacific? Hmm. Meeder's writing style is very poetical. She likes using lots of big, descriptive words. She likes nature and beauty and wild things. The pattern she uses throughout this book is to tell a story of something that happened in her life, and then to apply a spiritual lesson to her narrative. It's easy enough to follow and you can clearly understand the truth she is communicating about. I find no fault in any of her applications whatsoever. As I said, I just can't identify with the stories. My one and only pause for concern is that she weaved in a fictional story about a princess who makes a decision to stand for truth and becomes a (bloody) warrior for Christ. She trades in her princess gowns and fights battles, "For the King alone." The picture that Meeder is trying to paint, of course, is that we women are called to war for truth, for Christ. We have a high calling to follow after the Lord just as much as the men do. I do agree, but, in my opinion, women were called to war differently than men. I have a hard time believing that women were called to swing swords and drip blood. Certainly we women must stand for truth. Certainly when an enemy approaches we should be ready to defend ourselves from attack. We aren't supposed to be witless females, wringing our hands and wailing that we are incapable of drawing breath all by our lonesome. I'm not the type of female who goes around wearing dresses all the time, but I'm driven away from the image of a Woman as Action Figure. Meeder's fictional interjections are few and far between and therefore not terribly distracting. I just feel I should mention them because I'm not entirely certain exactly what she hopes for her reader to walk away with in those moments. The world defines peace as the absence of conflict, but God's peace is confident assurance in any circumstance. I very much liked her overall message. It was just wrapped in a package that is not all-together me. I actually debated over whether or not to talk about this book but then I was thinking about a few women I know who likely would identify with this title and the stories much better than I. There is a good audience for this book and, as I said, I can't think of any huge objections I would raise in response to reading it, excepting perhaps an acknowledgment that we probably differ on how we view The Role of the Female. So, I'll just put this book out there for your consideration. Thanks to Waterbrook Multnomah Publishing Group for shooting a copy of this one my way. You sound like you aren't quite sure what you think about this book. Maybe it's one of those that has nothing wrong with it but it just didn't resonate with you? LOL Stephanie. Well, I'll still be impressed. I am probably the least adventurous person out there, and I have very conservative views of womanhood as well, so I don't know if this would resonate with me, either, though I do like the message from what you've said here. "Elk hunting in the Coast Range" came the reply. "Did she get anything?" I asked. "1000 lb roosevelt elk. She quartered and hauled it out herself." I don't think there's anything WRONG with women elk hunting (and I was even impressed- what she did takes a lot of skill!) but it definitely wasn't something I could ever see myself doing. But other people don't want to do what I do, and it's all OK.
"I almost got stung by a bee once....I was close to the person who was stung." LOL! That really cracked me up, Carrie! It's always good to have you screen these books for us, and I look forward to your post another day about women on the home front. I couldn't help laughing my way through this post! :) I'm as far from adventurous as a person can get, so I don't think this book would be for me. @Taia - Well, I actually think that's rather impressive (in a good way)! @Mary Bailey & Bluerose Heart - heh heh. Great review. I think I would have the same reactions as you to this one. I too broke my arm and only got a sling. No cast. Sigh. I laughed at your list of adventures. : ) I'm about that exciting as well. Burst out laughing when I read your list of adventures. Mine is even less exciting. I was amazed at your having been skiing before. You're a veritable amazon warrior compared to me. hahaha! Last year I went through a battle. My despair, stress and panic attacks were keeping me from fulfilling my life, hope and peace in my Heavenly Father, the battle I fought out was completely of the spirit and while it did take its toll on me in the physical world I can say that in the spiritual world I was on a torn battlefield and I wielded a sword. I was finally brought down, and believe me, I didn't just hit my knees in that battlefield of my mind but I also threw myself in the deepest, bloodiest ditch. The only thing I knew was that I had to keep my face turned toward God, that somehow He would see me through. But I got in my own way. I stood between my upturned face and my Father. When I finally fell, when I finally gave all control up, He wasted no time in lifting me to my feet, His peace pervaded me and I knew I had won the battle, not by myself but by giving absolutely everything to Him. So while I do agree with you, CB, that women have a different role than man do, I also believe that at times, we have to be fierce warriors wielding swords and I hope at that time, the enemy feels the sting of my blade. When I am in situations now that over a year ago would have prompted a panic attack and instead I smile and pray, I do believe my sword has some blood on it. For I just lopped off the heads of the Snakes of Fear and Doubt! Thank you for your thought provoking review!